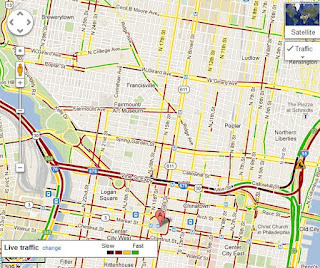 If you're ever feeling down about the slow traffic where you live, just look up Philadelphia, click layers then traffic. 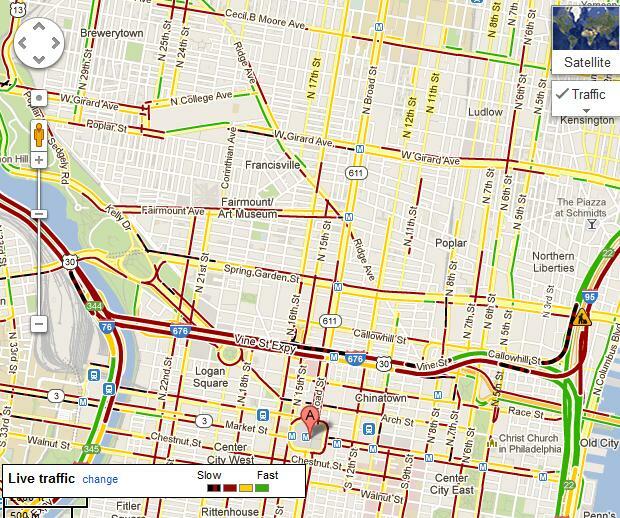 The red lines on the roads means miles of bumper to bumper cars crawling along. It may make you happy you are where you are. Above is a screenshot I captured as I was leaving to pick Lindsay up at work, before rush-hour. After living in Tennessee for some time, it was actually enjoyable to be back in faster paced travel. Generally, green-light take-offs, ninety-degree turns, and merges are quicker, cars flows above the speed limit and drivers don't slam on their brakes when they see a police car. At the same time, there is no getting around "The Traffic"; as in, stopped or crawling sections of highway. Without evening discussing rush-hour, there is weekend traffic, lunch traffic, rubber-necking traffic, and get-around-the-tourist-driver traffic that comes to a crawl at almost all major interchanges and merge points. Wherever one highway merges into another even if it's a 5-lane highway, 35mph is the norm in these areas. Since there are so many ways to get from one point to another, we've started using Google Maps with traffic view to check the route before leaving the house on busy days. It's under "maps" on android phones. You just add the traffic layer. I didn't know it was there since there was no need in Tennessee. It uses the cell phones that are in people's possession in their cars to monitor their motion and show what traffic is actually doing. It's creepy and interesting. They've activated the feature on over 130 cities.